Palestinians across the spectrum met in the legendary, and endangered, Kahn Al Ahmar last night in solidarity with Adnan Ghaith; recently arrested for “breaking Oslo law” by “cooperating with the PA’s security services,” according to the zionist-friendly newspaper Haaretz. The mendacity of using “Oslo law” to charge a Palestinian leader for the “rarely enforced” section 7 is blatant, as the Israeli government breaks both Oslo and international law frequently. Their intention to destroy Khan Al-Ahmar is but one example of this hypocrisy. 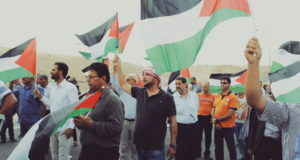 Adnan Ghaith’s arrest is seen by many as connected to his own solidarity with Palestinians, including by Abdullah Rahman, a Palestinian leader. 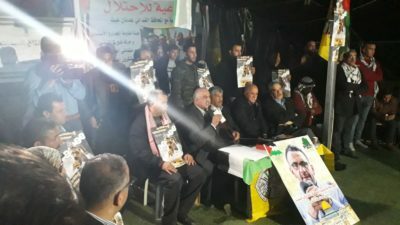 “We started a campaign six months ago to support the beduin people in Khan Al-Ahmar… They arrested (Adnan) because he started with us in this campaign of six months, and we succeeded in our campaign.” Khan Al-Ahmar has been the center symbol for holding what remanence is left of the chances of a Palestinian state. 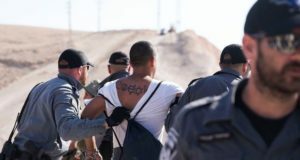 In May, the top Israeli court approved the village’s demolition, which is home to a tribe that has been displaced multiple times since 1950, beginning in The Negev Desert. “This is a small village- 187 people- but the school here (has) 185 students studying. Not only from Khan Ahmar community, but from 5 other communities. 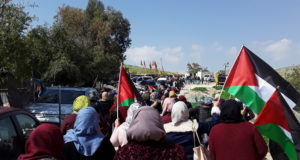 This is what it means… There are 45 other communities in the area from East Jerusalem to the Dead Sea… If we succeed to stop demolishing here, that means we succeed in other places.” Adnan Ghaith’s solidarity with the bedouins of Khan Al Ahmar was celebrated as they called for his release. Abu Khameesh is the leader of the village, and was born in Khan Al Ahmar, but remembers being moved around many times since 1953. “When we’re talking about Al-Khan Al-Ahmar, we’re not speaking of a piece of land that is some kilometer square, but a huge region that covers 1200 kilometers square, about 20% of the area of the West Bank.” To him, and many other Palestinians, saving Khan Al-Ahmar is more than just about the village, or even the greater area; it’s about the refusal to be displaced again. Arresting Adnan Ghaith, Abdullah Rahman, and others, are parallel to demolishing Khan Al-Ahmar. They are functions of the greater occupation. The word “occupation” sometimes gets lost in political and idealistic discourse, forgetting that it’s, simply, the systematic and aggressive ethnic cleansing of people who have lived in this land for thousands of years. For the native people of Palestine, people like Abu Khameesh, this is never forgotten. The refusal to be displaced again is the refusal to be erased. Israel has been breaking international law since its founding, and has consistently broken Oslo law since the accords.